Chorizo can be a fresh sausage, in which case it must be cooked before eating. In Europe, it is more frequently a fermented, cured, smoked sausage, in which case it is often sliced and eaten without cooking, and can be added as an ingredient to add flavour to other dishes. 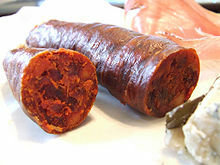 Spanish chorizo and Portuguese chouriço get their distinctive smokiness and deep red color from dried smoked red peppers (pimentón/pimentão). Due to culinary tradition and the high cost of imported Spanish smoked paprika, Mexican chorizo is usually made with native chili peppers of the same Capsicum annuum family, used abundantly in Mexican cuisine. In Latin America, vinegar also tends to be used instead of the white wine usually used in Spain. Chorizo can be eaten sliced in a sandwich, grilled, fried, or simmered in liquid, including apple cider, other strong alcoholic beverage such as aguardiente. It also can be used as a partial replacement for ground (minced) beef or pork. Spanish-style tapas bars that serve traditional Spanish-style chorizo have gained in popularity in recent years, and now appear in many large cities throughout North America and in parts of Europe. Depending on the variety, chorizo can be eaten sliced without further cooking, sometimes sliced in a sandwich, or barbecued, fried or baked alongside other foodstuffs, and is also an ingredient in several dishes where it accompanies beans, such as fabada or cocido madrileño. The version of these dishes con todos los sacramentos (with all the trimmings, literally sacraments) adds to chorizo other preserved meats such as tocino (cured bacon) and morcilla (blood sausage). Portuguese chouriço is made (at least) with pork, fat, wine, paprika, garlic and salt. It is then stuffed into natural or artificial casings and slowly dried over smoke. There are many different varieties, differing in color, shape, seasoning and taste. Many dishes of Portuguese cuisine and Brazilian cuisine make use of chouriço – cozido à portuguesa and feijoada are just two of them. In Portugal, there is also a blood chouriço (chouriço de sangue) similar to the black pudding, amongst many other types of enchidos (Spanish: embutido), such as alheira, linguiça, morcela, farinheira, chouriço de Vinho, chouriço de ossos, chourição, cacholeira, paia, paio, paiola, paiote and tripa enfarinhada. Based on the uncooked Spanish chorizo fresco, the Mexican versions of chorizo are made from fatty pork (however, beef, venison, kosher, and even vegan versions are known). The meat is usually ground (minced) rather than chopped, and different seasonings are used. This type is better known in Mexico and other parts of the Americas, and is not frequently found in Europe. Chorizo and longaniza are not considered the same thing in Mexico. The area of Toluca, Mexico, known as the capital of chorizo outside of the Iberian Peninsula, specializes in “green” chorizo, which is made with tomatillo, cilantro, chili peppers, garlic or a combination of these. The green chorizo recipe is native to Toluca. Most Mexican chorizo is a deep reddish color, and is largely available in two varieties, fresh and dried, though fresh is much more common. Quality chorizo is made from good cuts of pork stuffed in natural casings, while some of the cheapest commercial styles use variety meats stuffed in inedible plastic casing to resemble sausage links. Before consumption, the casing is usually cut open and the sausage is fried in a pan and mashed with a fork until it resembles finely minced ground beef. A common alternative recipe does not involve casings: ground pork and beef are cured overnight with a little vinegar and a lot of chili powder. Served for breakfast, lunch, or dinner, it has the fine mince-texture mentioned above, and is quite intense in flavor.